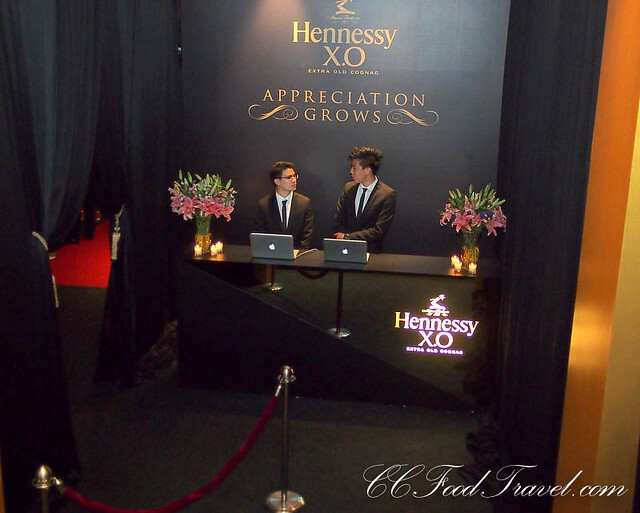 This next installment of the Hennessy XO Appreciation Grows, entitled The Spirit of Conquest, was held at the Chin Woo Stadium in KL. Remember all the tres chi chi and rather interestingly themed Hennessy XO Appreciation Grows dinners ? (here’s one, and here’s another).. Well, the time had arrived for the next one.. this time held right in KL, at the iconic Chin Woo stadium, and would be called The Spirit of Conquest. Why The Spirit of Conquest ? Because the dinner would be about setting sail around the world, and taking our palates on a journey of international cuisines, and experiencing their cultural differences. 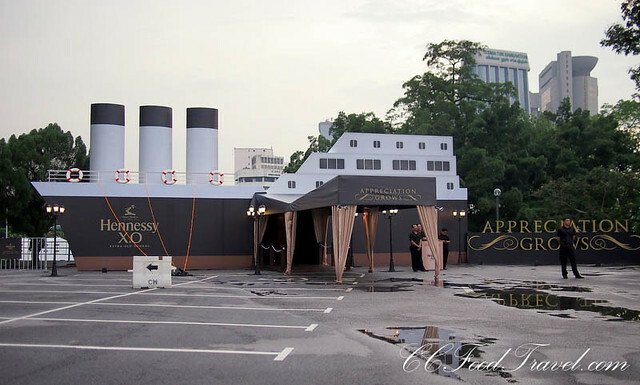 To execute this sort of theme on a large scale, the team employed the venue of Chin Woo Stadium, to erect a “ship” facade that would set sail metaphorically around the world, with Chef Lee Anne Wong, as the Captain and skipper of the ship. The structure was actually built on top of the Stadium’s swimming pool, so thank God it did not collapse and the night actually progressed without a hitch! nice warm welcoming committee .. The experience for guests began with an invitation in the form of a boarding ticket, and upon arrival at the ‘port’, guests dressed in black tie and evening finery, made their way to the holding lounge of the “ship” – The Spirit of Conquest – a generous hall elegantly decorated with Chesterfield sofas and paintings of Maison Hennessy to greet familiar acquaintances as well as make new ones over glasses of Hennessy X.O. lovely ladies with the Hennessy XO tipple in hand..
in the true Spirit of Conquest, we set sail to gay Paris! 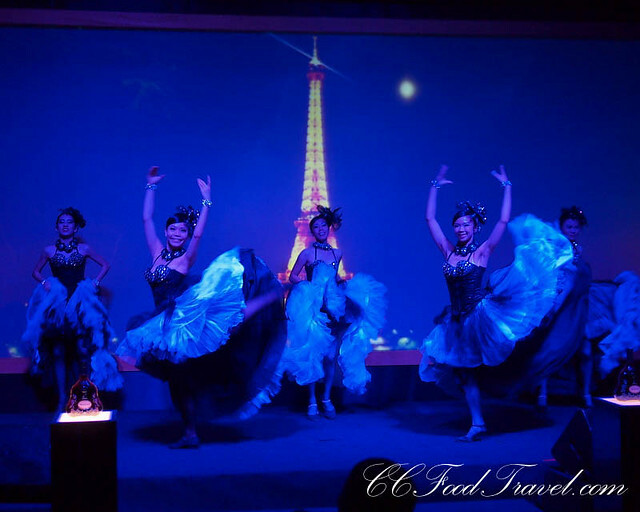 Can- can lasses doing their thing.. If there’s one thing that goes terrifically well with cognac, it would have to be the unctuous foie. 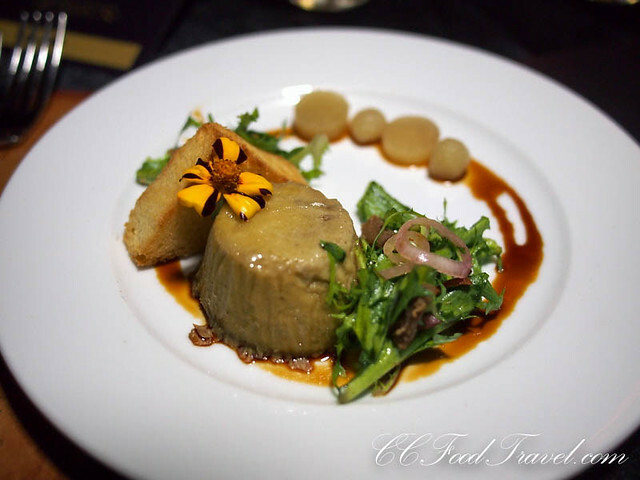 This dish of Foie Gras Flan, Duck Confit, Green Apples and Frisee Lettuce was incredibly rich and creamy, but it had the lovely light flavours of apple and frisee that helped dissipate the heaviness. 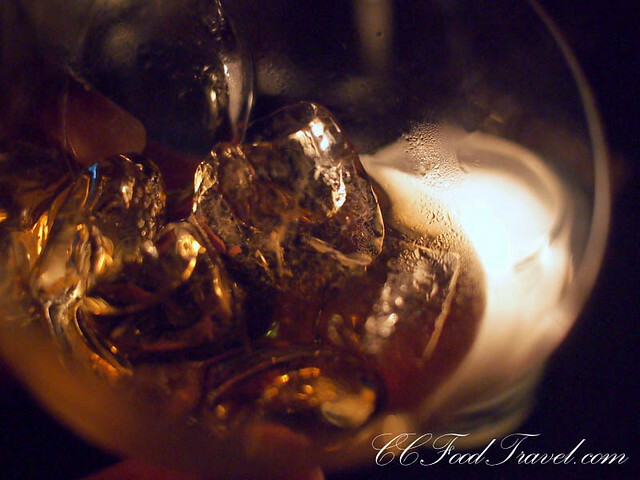 Pair that with the Hennessy XO neat and what you have, is a great mouth-watering combo, worthy of dining accolades. Chef Lee Anne pulled this one off with great finesse. Loved this first starter. 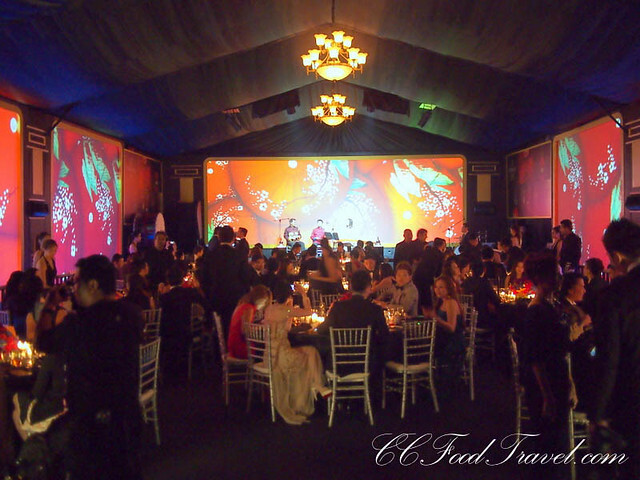 The gorgeous dining hall – fashioned to look like the ship’s deck, and with the moving images on the screen, we felt like we had set sail to sea! 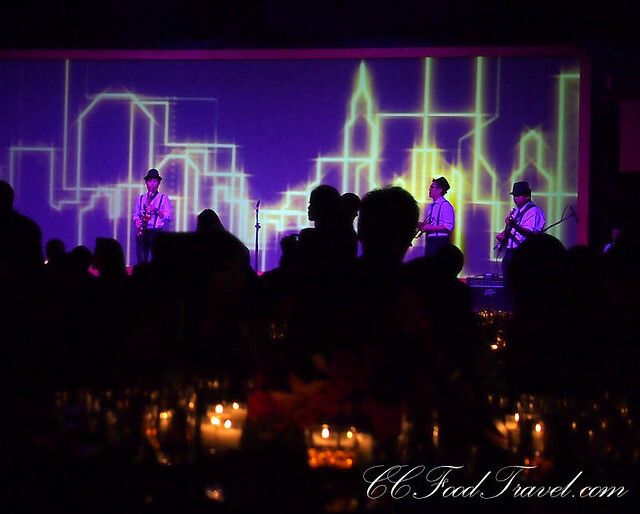 Guests were seated in the main dining hall – a stunning floating platform on water, designed in the Art Deco style of an early 19th century steam liner, replete with chandeliers, banquet style seating and freshly cut flowers on each table. 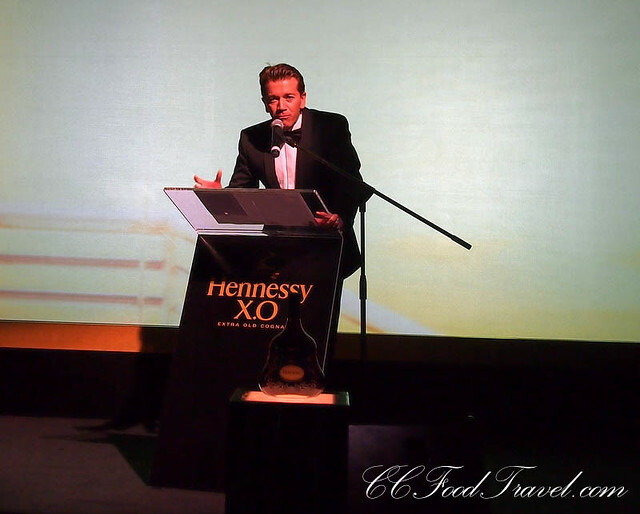 Since the Spirit of Conquest dinner tells the story of the cognac’s past, present and its future, we were taken on a journey around the continents, such as China, New York, Italy, Russia and Japan. And at this next stop, we visited China. 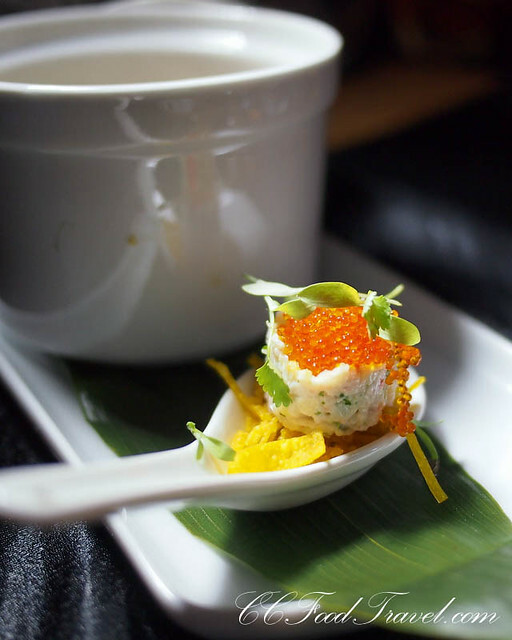 This Corn soup dish was served with the golden crab and caviar on the side. We were told to dunk the ingredients perched on the spoon into the soup, and give it a good stir. A nice dish and I appreciated the caviar, the crab lime and coriander flavours leading a harmonious twist to the otherwise plain corn soup. Since the soup was hot, I had it with the Hennessy X.O and water. The first sip is always the best, I think, as the cognac has a bit of a lighter mouthfeel with distinct wood and spice on the palate. A woodiness that complemented this asian dish for sure. Next stop, the great US of A! This dish of Salmon, Cow-boy style peanuts, Okra, browned butter and Citrus was so gorgeously presented. 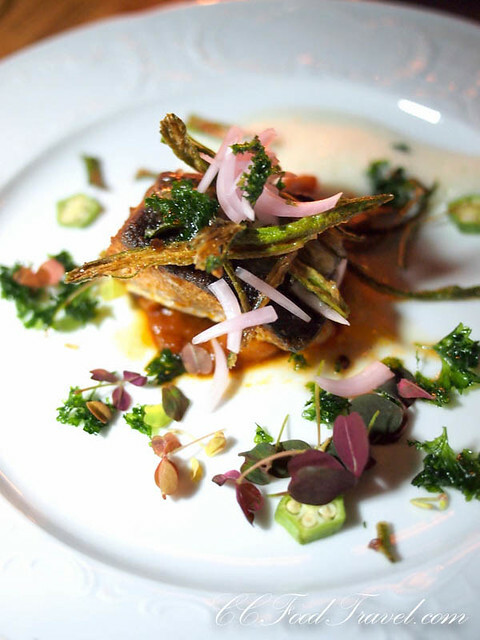 I liked the freshness of the fish and the delicate, colorful garnishing added a nice whimsical feel to the dish. Western Allure, a dish of spice-rubbed American salmon, incorporated true American flavors and ingredients as they would have been at the end of the cowboy days, and partnered perfectly with Hennessy X.O and ice. 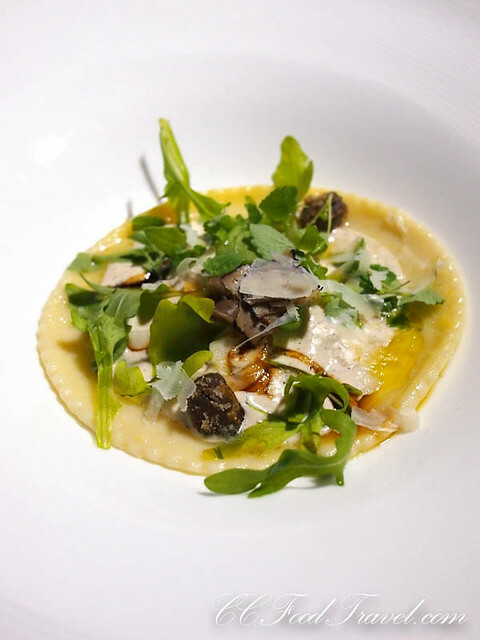 Then it was off to Italy, for the Venetian Chicken and Porcini Mushroom Ravioli served with Truffle Parmesan Cream. Another fabulous dish in presentation as well as taste. The Hennessy XO is such a refined and elegant drink, and with a nose that has lovely toffee and spice notes, this paired stupendously well with the creamy ravioli. 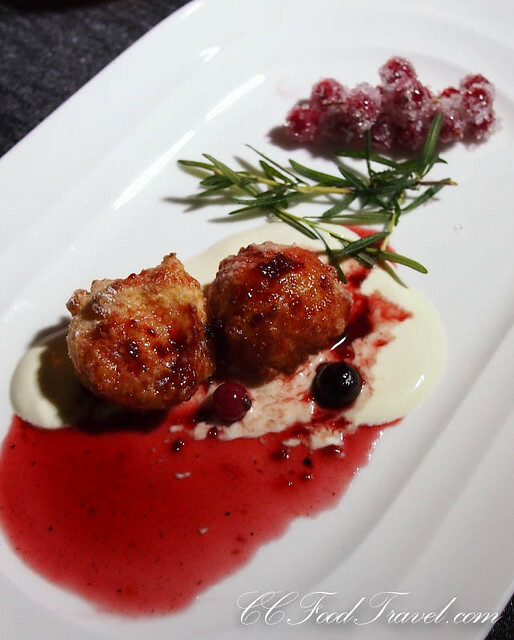 And only too soon, it was time to set sail to Russia, for our dessert of Syrniki Cheese curd Fritters, Sour cream and Dark fruit sauce. The folk- based Mazurka dance, which emphasises the importance of sociability, a trait shared by Hennessy X.O was the graceful highlight of The Spirit of Conquest’s stay in Russia. Another winner – I think this being the second last dish, it would be safe to say Chef Lee Anne had most certainly hit a homerun. She has a great understanding of Eastern and Western dishes which makes her food such a pleasure to eat. Forget molecular, just stick to making good old fashioned food well, in a good old fashion way. 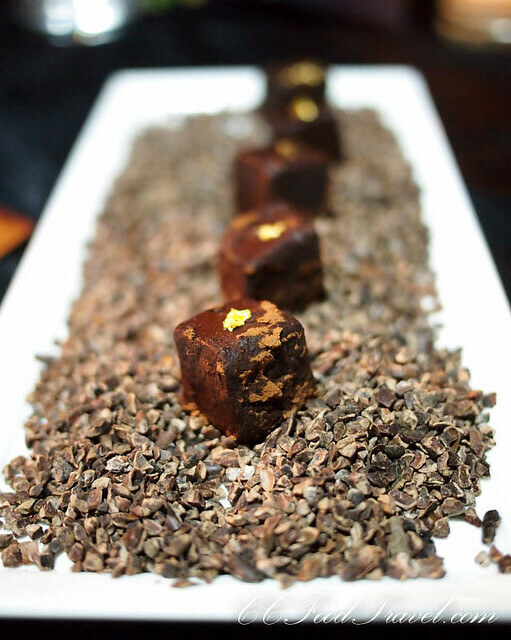 Dark Chocolate Ganache – wow, not 1 nor 2 but three desserts! Great for folks with a sweet tooth! 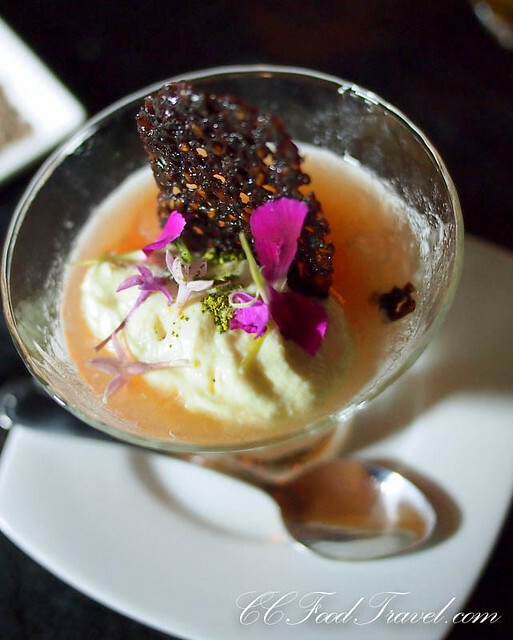 Finally, it was time to say Sayonara, as we arrived at our final port in Japan – this parting dessert of Grapefruit Gelee with cream, Grapefruit ice and Sesame Brandysnap was such sweet sorrow! And with that, our journey with Hennessy X.O came to a resounding conclusion with a spirited drum performance by the Wadaiko Syo troupe. 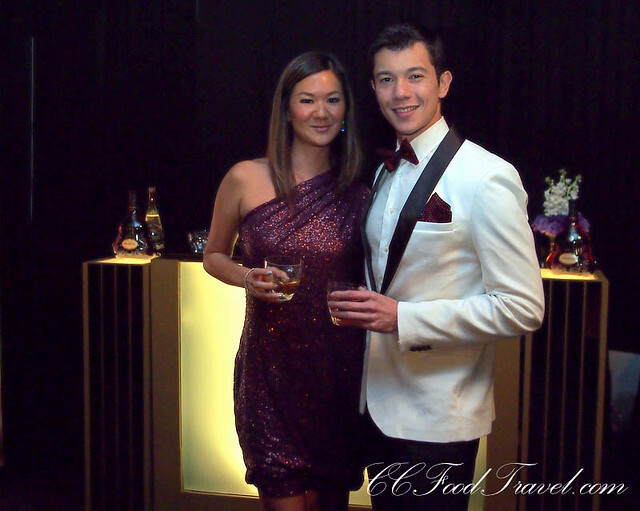 We loved the entire repertoire of Chef Lee Anne Wong’s specially crafted dinner – she really took us on a journey worth remembering and worth talking about. I am guessing that this dinner would rank high, in most guests books, on the Hennessy XO Appreciation Grows series of dinners. This might be the one to top, yet! Can-can girls say.. Au revoir ! Thanks for the FB love! The “ship” definitely looks cool and all the food are so nicely prepared, awesome! well this chinese have been pairing cognac with EVERYTHING since the dawn of time, so there’s no reason why foie won’t go with it LOL! good food, great drinks, and hot chicks, what more can one ask for?